It was a busy night in sports last night with wild playoff action AND the NFL Draft. First up, Game 6 of the Lakers/Hornets series. 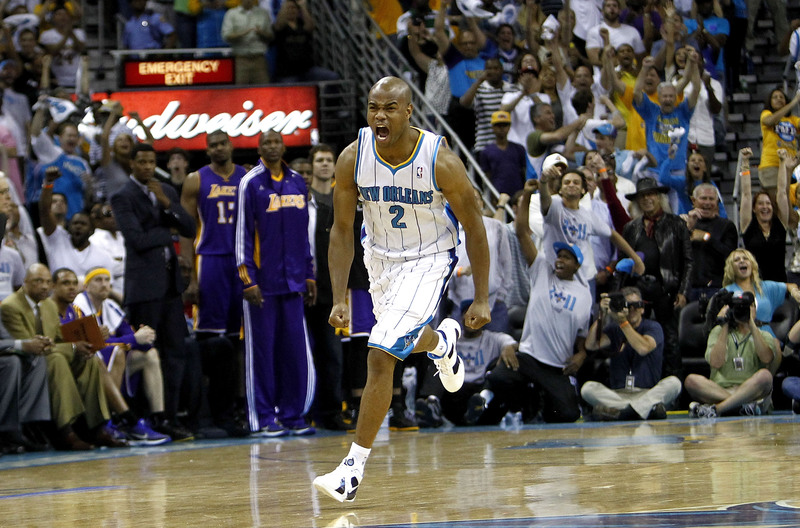 The game was back and New Orleans and it was do-or-die for the Hornets. Unfortunately, that reckoning day finally came for New Orleans, as they just couldn’t get anything going. The stifling Lakers defense held them to just 43% shooting in the first half, and they simply were unable to comeback. 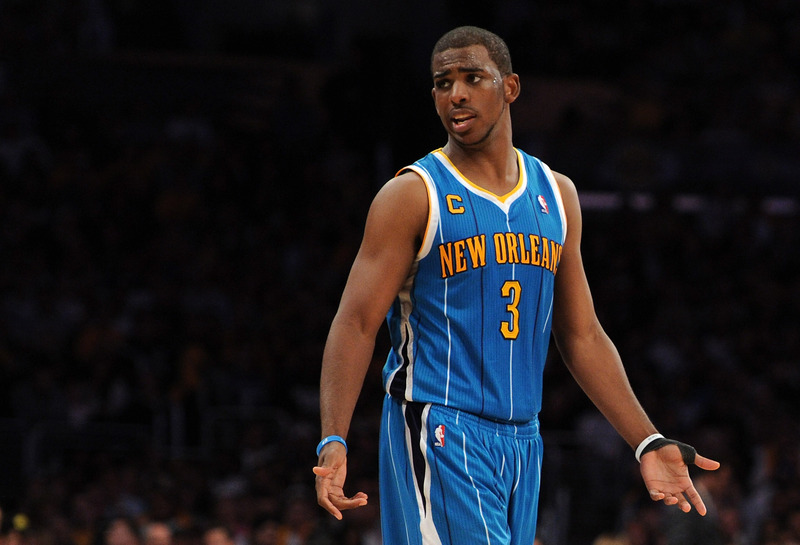 Chris Paul failed to have one of his AMAZING nights, only finishing with 10 points. With the win, the Lakers now move on to the second round… still as defending champs. Los Angeles 98, New Orleans 80. Next up, it was do-or-die for the Orlando Magic as they headed to the “Highlight Factory” (what Atlanta dubs its stadium). The Magic absolutely steamrolled the Hawks in Game 5, and it prompted experts around the country to pick them to win the series. The Hawks didn’t like that. They came out steaming mad and basically kept a 10 point lead throughout the game. But, Dwight Howard came alive for the Magic, putting up 25 points, and nabbing 15 rebounds. 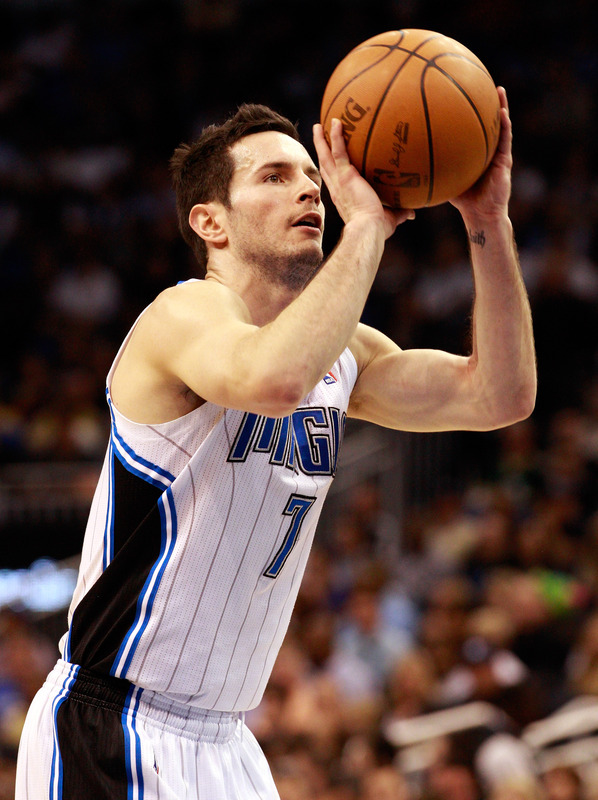 Suddenly, in the end, the Magic found themselves down 3. J.J. Reddick took a wide-open 3, but bricked it. Yet, the Magic got another shot. Jason Richardson hoisted it up, but it was blocked by Atlanta, and they clinched the series. Next up for Atlanta: The Chicago Bulls. Atlanta 94, Orlando 91. Then, it was Game 6 between the Dallas Mavericks and the Portland Trail Blazers. Before the playoffs, everyone was predicting this would be the upset of the first round. The Mavs, however, have looked fantastic this post-season. They’re playing as a unit, and really believe they can win it all. They led most of the way, but the Blazers did get it to a 1 point lead mid-way through the first. But the Mavs were simply shooting the lights out. It’s as if they couldn’t miss down the stretch, and the Blazers just couldn’t trim the lead in time. The Mavs clinch the series and will now begin what will be an amazing battle with the Lakers. Dallas 103, LA Lakers 96. Finally, last night it was Round 1 of the NFL Draft. 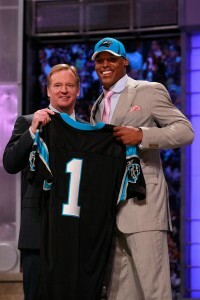 The Panthers took Heisman Trophy Winner Cam Newton with the overall #1 pick, which many are dubious of. 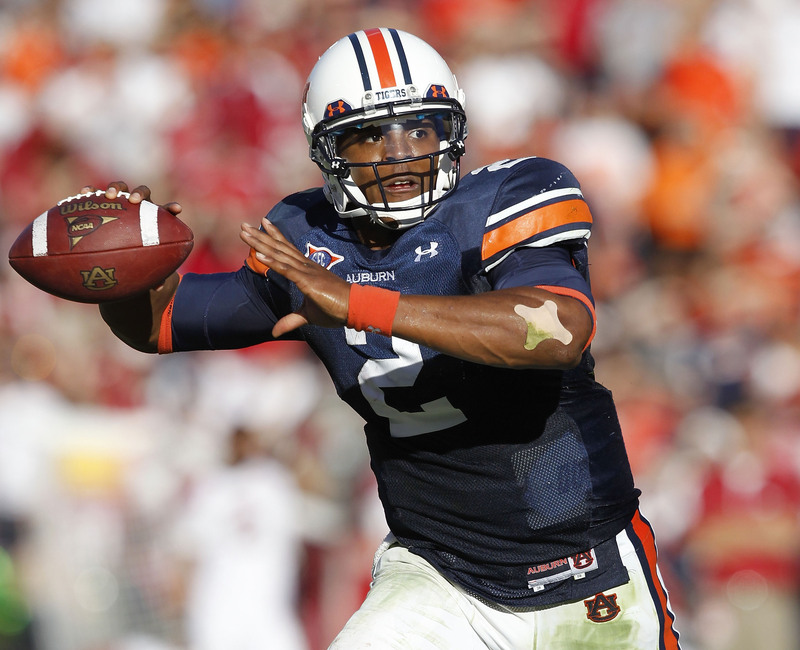 Newton is good, to be sure, but it’s very possible he was built to excel in the college game… not the pros. Washington star quarterback Jake Locker went to the Titans at #8 (much earlier than anticipated) and the Falcons traded WAY up to take Alabama’s awesome receiver Julio Jones. Atlanta finished with the #1 seed in the NFC last year, and they want to take advantage of that window by adding another offensive super weapon to help them put up points. They need to be able to put serious points on the board if they expect to compete with the Packers, Eagles, Saints, Cowboys, and other high-scoring teams in the NFC. And former Heisman Trophy Winner Mark Ingram went to the Saints, and gave an emotional heartfelt speech after listening to a letter written by his dad (who is currently in prison). It was a special night, and hopefully they settle the lockout mess and we get the NFL this coming fall. Things heated up Wednesday night in the playoffs. 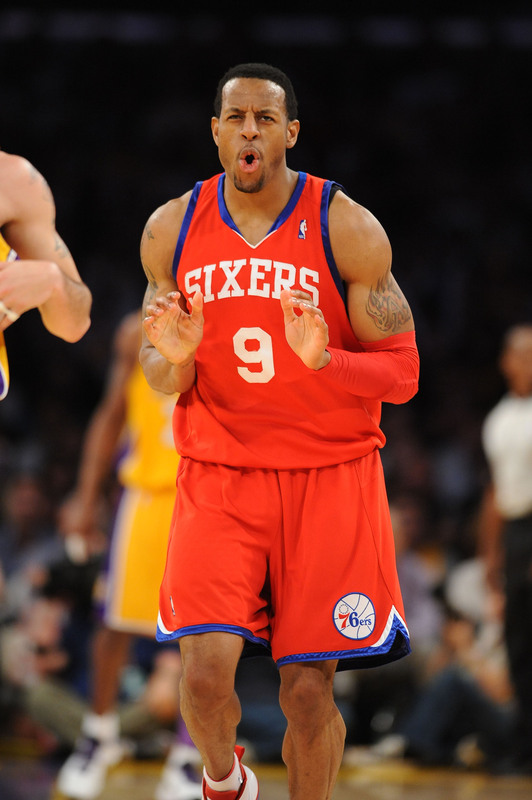 First up, it was Game 5 between the Miami Heat and the Philadelphia 76ers. Philly was able to keep the series alive, but, in front of their home crowd, the Heat brought their firepower. Dwayne Wade put up 26 points, 11 rebounds, and 7 assists, but that didn’t make the Sixers go-away. From out of nowhere, Andre Igoudala came to life in this series and posted his own 22 points to keep the game close in the end. But, this veteran Heat team knows what it takes to close-out games, especially important home games, and they rolled onto a victory. Next up for LeBron and Company — the Boston Celtics. Miami 97, Philadelphia 91. Next up, an absolute nail-biter between the Memphis Grizzlies and San Antonio Spurs. Going into the game, the Grizz had a 3-1 lead on the series, and were hoping to put the nail in the coffin. However, San Antonio is very tough to beat in front of their home crowd. The Spurs got off to a hot start and led by 8 at the half. But, in the 3rd quarter, the Grizzlies had a resurgence and outscored the Spurs 26-15. The game came down to the wire, but the #1 overall seed found themselves down by 3 with just under 10 seconds. They had a horrible inbound play, the ball got loose, Manu Ginobili got it, chucked a 3-pointer off-balance and… GOOD!!! Wow! But, the refs had to review it, and it ruled that Ginobili had a foot on the line. It was only a 2-pointer, and the Spurs still trailed by one. The Grizzlies hit two free throws at the other end to put them back up by 3 with 1.3 seconds left. The Spurs inbounded to Gary Neal, he took one dribble, and launched up a 3, and… GOOD!!!! Wow, unbelievable! That forced an overtime, where the Spurs had all the momentum. They took the victory to send it back to Memphis. Can Memphis close it out, or will they have to win a Game 7 back on the road? San Antonio 110, Memphis 103. Finally, Kevin Durant and the Oklahoma City Thunder were back home to try and close out the series against the Nuggets. That wouldn’t prove easy, as the Nuggets had no intention of going home. Denver brought their balanced scoring attack and team play that they’ve had since the Carmelo Anthony trade. 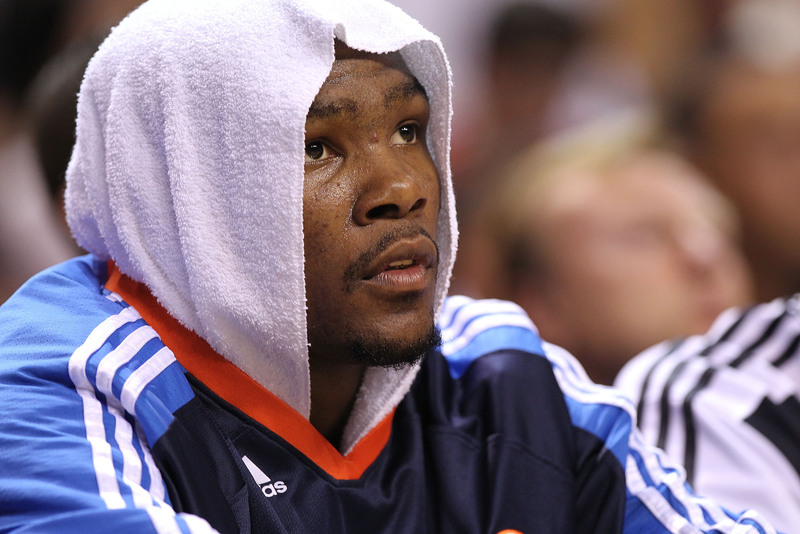 But, in the end, Kevin Durant turned on the Jets. He finished the night with 41 points, and the Thunder found themselves up 3 with just under 20 seconds to go. Then, the Thunder had a terrific defensive stand to seal the deal and send them to the 2nd round. Wow, the Thunder move on — who would have ever thought. They now await the winner of the Spurs/Grizzlies series. OKC 100, Denver 97. And, as a reminder, the first round of the NFL Draft is on Thursday night at 8pm ET. In the NBA, the Chicago Bulls were looking to close out the series on a pesky Indiana Pacers team. The Pacers were down 3-1 in the series, but they’ve barely lost every game. The series record could easily be the other way. In Game 5, Derrick Rose had to play on a sprained ankle, and when the Bulls don’t have Rose at 100%, the entire crowd has to hold their breath. But, last night, the entire Bulls teams stepped up, especially Luol Deng, who is quickly becoming the #2 scoring option behind Rose. The Pacers did what they could, and got a nice 20-point night from Danny Granger, but the Bulls simply ran away with the game and advanced to Eastern Conference semi-finals. Chicago 116, Indiana 89. Next up, it was a pivotal Game 5 for the Orlando Magic. They were down 3-1 in the series, and it was win or STAY HOME on their home court last night. The Atlanta Hawks just seem to have their number — defending the Magic well, and making it so Dwight Howard has to do ALL the work. They’re letting him get his points, and stifling the rest of the Orlando team. But, last night, the Magic were an absolute force. They steamrolled the Hawks, and, beyond that, Dwight Howard battled foul trouble and was on the bench quite a bit. He hit only one field goal on the night, and the Magic’s best player out there: J.J. Redick with 14 points and 3 rebounds. With this kind of pummeling, the Hawks better close out the series in Atlanta in Game 6 or they could be in serious trouble in Game 7. Orlando 101, Atlanta 76. Finally, the game everyone was talking about — the important Game 5 between the Hornets and the Lakers. Many expected the Lakers to sweep this series, but the Hornets are putting up a fight. With the series now a best of 3 (as it’s tied at 2), it’s really anybody’s series. Remember, the Lakers may be a better team, but if they play poorly just two nights, they’re out. Last night they came to play. 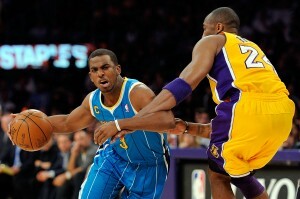 They had an even scoring attack, and Bynum and Kobe led the way with 18 and 19 points respectively. Chris Paul had another amazing game with 20 points and 12 assists, but this Hornets team doesn’t really have a comeback in them. They need to keep it close the whole way and hope they can win in the end. But, if they fall behind by more than 7 points, it’s really hard for them to regain the lead. And the Lakers are a much bigger and tougher squad that’s hard to defend on consecutive possessions. Either way, the series heads back to New Orleans for Game 6 with the Lakers up 3-2. LA Lakers 106, New Orleans 90. Last night, the San Antonio Spurs, the top seed not only in the West, but in the entire NBA needed to even the series before it headed back to San Antonio. 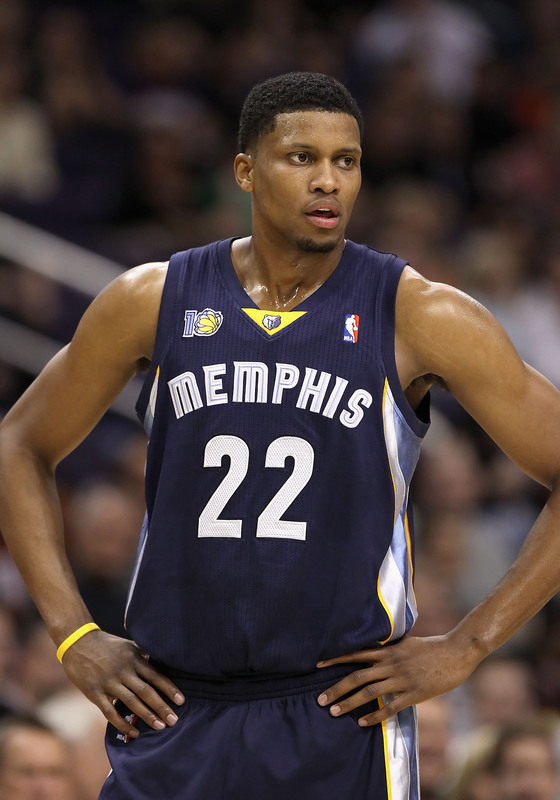 The Memphis Grizzlies, however, are playing terrific basketball right now, and they’re doing it without their best all-around player in Rudy Gay. It’s just pure teamwork and energy out there. So, the game stayed pretty close in the first half, and the Spurs led by two going into the locker room. At the half though, Memphis’ O.J. Mayo said that their coach, Lionel Hollins, lit a fire under them, saying they were playing horribly and that they need to play more desperate, because it’s the desperate teams that usually win. With that, Mayo said, they couldn’t wait to get back on the court. And once they got out there, they were on FIRE! They opened the half with a 14-0 run and NEVER looked back. In the end, the Grizz won by 18, and are now just one game away from eliminating the Spurs from the post-season. But… they always say, the last win is the hardest one to get, and you better believe the Spurs will come out ferocious in Game 5. Memphis 104, San Antonio 86. Then, it was a much anticipated game between the Dallas Mavericks and the Portland Trail Blazers. After Brandon Roy’s heroics in Game 4 to even the series at 2, the Mavs knew they had to defend their home court if they wanted to make it out alive. Mavs superstar Dirk Nowitzki was going to ensure they won this game. He finished the night with 25 points and 8 rebounds. The Blazers tried to come back in the 4th quarter, but their shooting was atrocious. They missed 10 straight field goals, and Dallas just kept on rolling. Now, Dallas takes a 3-2 lead. Do the Blazers have another miracle in them at home? Dallas 93, Portland 82. And on Thursday night this week, it’s the always anticipated first round of the NFL Draft. This year, the coverage of the draft has been in your face 24/7, because there really isn’t any NFL free agency news to report with the lockout. So, we’ve seen about 65 iterations of a first round mock draft. 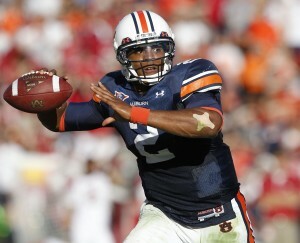 In the current mocks, the experts have Heisman Trophy Winner Cam Newton going first overall to the Carolina Panthers. Last year, the Panthers took Notre Dame’s Jimmy Clausen to be their future franchise QB, but he hasn’t performed well, and they think they might have something special in Newton with the #1 overall. We shall see. What a wild weekend for the NBA playoffs. We saw the Pacers win a game against Chicago, Oklahoma City take a commanding 3-0 lead over Denver AND #8 seed Memphis take a 2-1 lead over the #1 seed in the NBA!! (San Antonio). It’s been action-packed. And Sunday… even more! First, Miami was hoping to close and sweep the Sixers. But… they would have to do it in front of a raucous Philadelphia crowd. This would not prove easy. LeBron had an amazing game with 31 points and 7 rebounds, and it looked like Miami was going to cruise again and roll on to the second round. But, the fighting spirit of the 76ers kept them in the game AND kept the score very close in the final 2 minutes (which is when anything can happen). So, down by 1, their guard, Lou Williams, hit a long range 3 with a hand in his face to put the Sixers up by 2. That begged the question… who will take the last shot for Miami? This has not been their bread and butter this season. The answer this time: LeBron, who threw up a brick. Tough break for Miami, as they will most likely seal the deal on their home floor (not necessarily a bad thing), but will put them on less rest heading into the second round. Philadelphia 86, Miami 82. 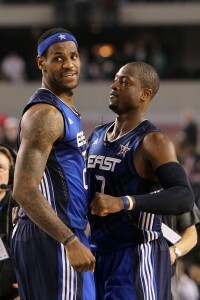 And, if Miami does get to the second round, which team will they play? Remember, the New York Knicks started off the season pretty hot. They were jelling, and were led by Amare Stoudemire. Then, they were plagued by rumors of a Carmelo Anthony trade that eventually came true. This resulted in trading their core guys for a superstar and a solid point-guard in Chauncey Billups. Unfortunately though, they got swept in the first round of the playoffs. 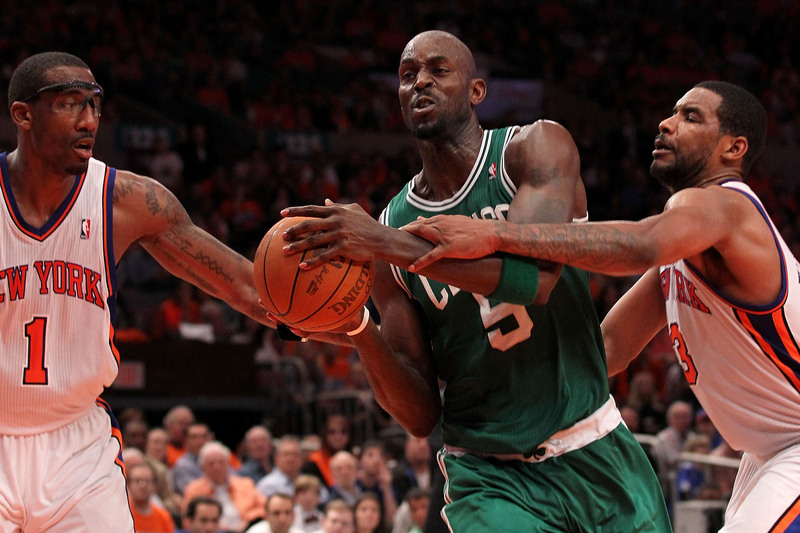 Kevin Garnett and the Celtics steamrolled over the Knicks in Madison Square Garden. Garnett finished with 26 points and 10 rebounds. Knicks fans can only hope that they turn things around in the off-season, which might mean a coaching change. Boston 101, NY Knicks 89. The NBA playoffs keep on rolling on. 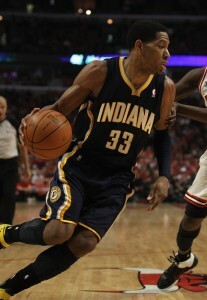 First up, it was the much anticipated Game 3 between the Indiana Pacers and the #1 seed Chicago Bulls. 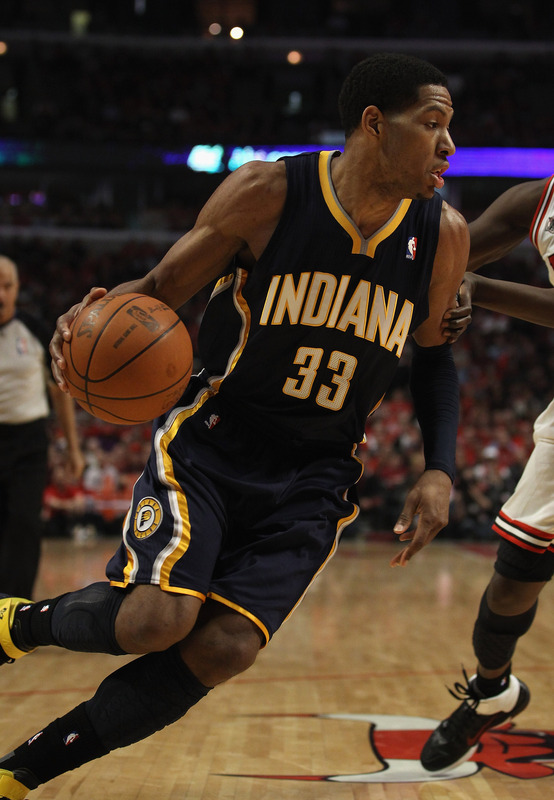 The Pacers have been giving the Bulls fits the past 2 games. However, the Bulls still nabbed both Game 1 and 2. Thus, everybody thought the Pacers would be READY for Chicago when they played in front of their own home crowd. The Pacers Danny Granger had a nice evening with 21 points, but Derrick Rose got some serious help last night from Luol Deng. Deng finished the night with 21 points of his own. At the end, down 2, Danny Granger had a chance to win the game. He launched a long-range, off-balance 3-pointer, but it clanged off the rim, Chicago grabbed the rebound, and went on to win Game 3. That’s a 3-0 lead for the Bulls. Chicago 88, Indiana 84. Next up, it was Game 3 between the Miami Heat and the Philadelphia 76ers. Dwayne Wade and LeBron have pretty much had their way with the Sixers, but the series was back in Philly, and you can bet they would come to play. The Sixers actually kept the game close, even took a big lead at the half. But, at the end of the 3rd quarter, the Sixers were only up 2, and that’s simply not enough when you’re playing against 2 of the absolute best players in the NBA. 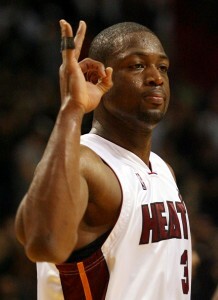 Wade had a spectacular night with 32 points and 10 rebounds, the Heat just pulled away in the 4th quarter. Philly isn’t strong enough to keep up with Miami, and the Heat should cruise into a second round battle with either Boston or New York. Miami 100, Philadelphia 94. Finally, it was the Dallas Mavericks heading to Portland to take on a now-furious TrailBlazers team. Portland has a reputation for being one of the toughest places to play in the league. Their fans simply go CRAZY! The Mavs were prepared to stop LaMarcus Aldridge and even Gerald Wallace, but they never saw amazing nights from Wes Matthews and Brandon Roy coming. Roy had 16 points for the Blazers OFF THE BENCH! And Matthews had a surprising 25-point outing. On top of all of that, the Blazers defense was able to stop a red-hot Mavericks attack. It seemed like they really studied Game tape of the first two games. Dallas now leads the series 2-1. Portland 97, Dallas 92. 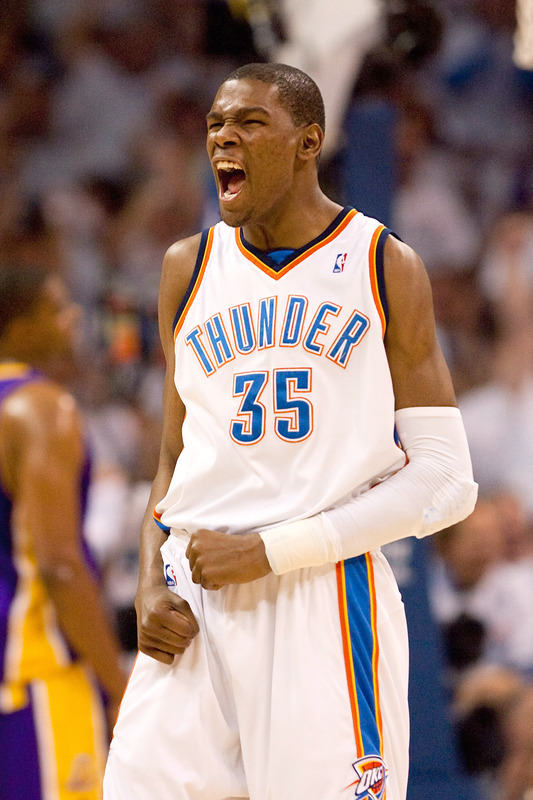 First, it was Game 2 between the #4 Oklahoma City Thunder and the #5 Denver Nuggets. The Thunder took Game 1, but Denver hoped to even things up in Game 2. That’s not exactly what happened, as Denver came out soft and sloppy. They couldn’t buy a bucket, and soon found themselves down by 20 points. Not exactly where you want to be in the playoffs. Ty Lawson had a nice game for Denver with 20 points, but Kevin Durant and the Thunder excelled and held off a late Nuggets comeback to take a commanding 2-0 lead heading back to Denver. The Thunder recently got a victory in Denver, but let it be known that the Nuggets are VERY tough to beat on their home floor. OKC 106, Denver 89. 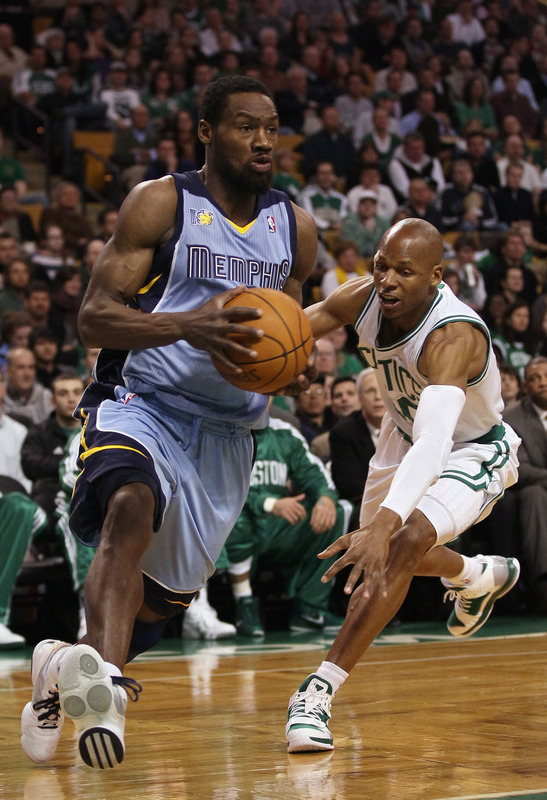 Next up, it was Game 2 between the #1 San Antonio Spurs and the #8 Memphis Grizzlies. The Grizz stole Game 1 by playing some ferocious basketball, and keep in mind that they’ve been playing strong without their best player, Rudy Gay. He’s out for the season. 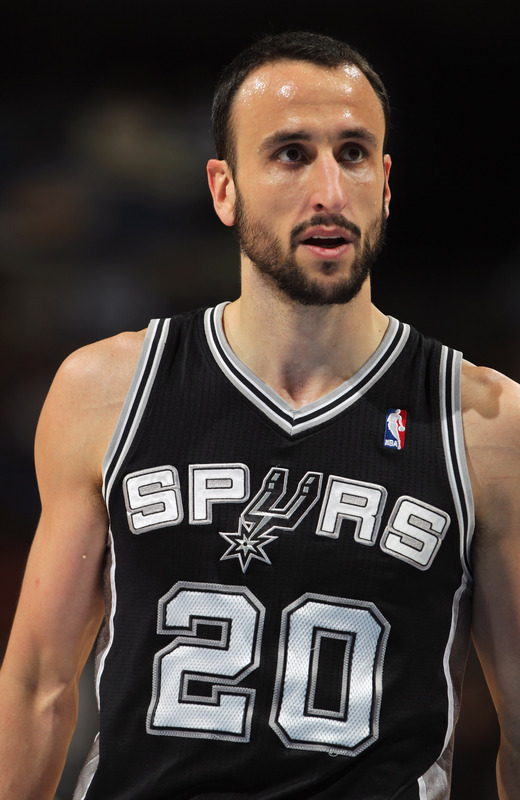 But the Spurs had their best player, Manu Ginobili, back in the line-up for Game 2. The game was close for a while, but the Duncan (16 points, 10 rebounds), Ginobili (17 points) combo was too much for the Grizz. Now, the series is tied at 1 game a piece heading back to Memphis. Finally, it was the game that everybody wanted to see: The Lakers vs. The Hornets. The Hornets nabbed a win in LA in Game 1, and all the Laker radio stations couldn’t stop talking about how their dynasty was in jeopardy. At this point, nobody knows which Laker squad is going to show up: The defending champions who can play big and pummel you, or the old-man Lakers who practically just lay down and die. Fortunately for the Lakers, they’re playing a very shaky and inconsistent Hornets team. Sure, they have Chris Paul (one of the best players in the league), but little else. Paul finished the game with 20 points and 9 assists (including some amazing end-of-quarter 3 pointers), but the Lakers brought their defensive A-game, and were able to roll to the victory. The series now heads back to New Orleans, which doesn’t exactly have the most electric home crowd. Then again, when the Lakers come to town, people show up. LA Lakers 87, New Orleans 78. In the NBA, the playoffs keep marching on. First up, it was the New York Knicks vs. Boston Celtics. The Knicks barely lost Game 1, and were looking to hopefully steal a win in Boston. However, their point-guard, Chauncey Billups, who said that the Knicks were the most dangerous lower seed to play in the first round, was actually out injured for the game. But, Carmelo had such an amazing night, it made up for it. Carmelo finished the evening with 42 points and 17 rebounds, but would that be enough? 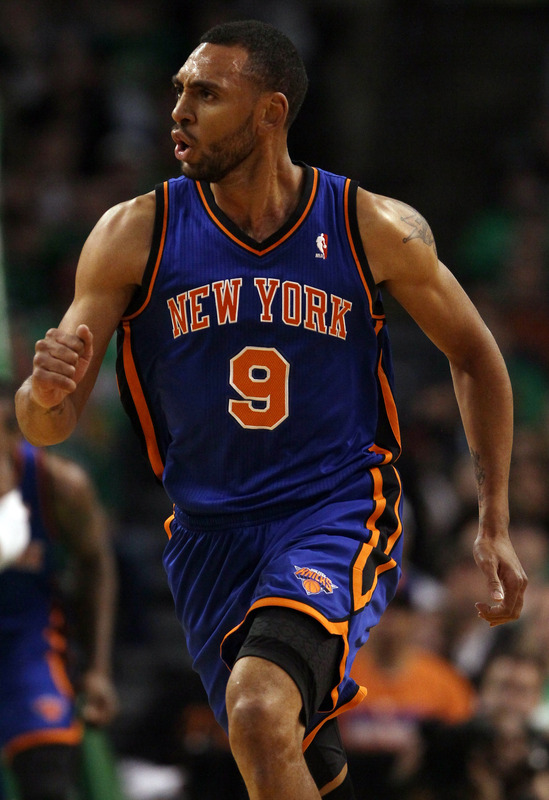 The Knicks’ Jared Jeffries hit a beautiful shot to put the Knicks up 1 with under 20 seconds to go. Then Garnett hit a fade away hook shot to put the Celtics up one. The Knicks went back to Jeffries, who turned the ball over (or Garnett stole it — depends how you look at it), and the Celtics had the ball with 4 seconds left. Then, they in bounded, and Carmelo didn’t foul because he had 5 fouls and would foul out. Unfortunately, the clock ran down and gave the Celtics a 2-0 lead. Boston 96, NY Knicks 93. Next up, it was the Atlanta Hawks vs. the Orlando Magic. The Hawks stole a victory against the Magic in Game 1, and you can bet that Orlando was looking for revenge. It wouldn’t come easy as the Hawks refused to go away. Josh Smith led the way with 17 points and 6 rebounds. 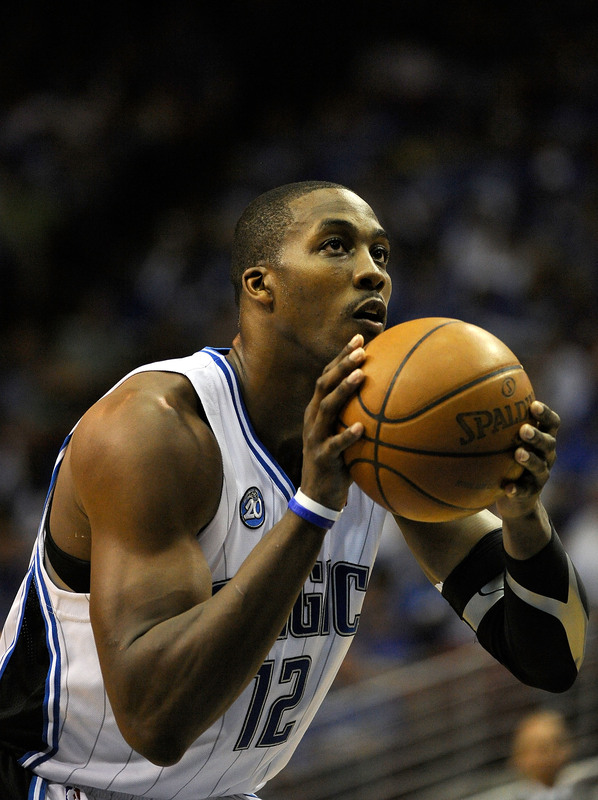 Dwight Howard had another dominant night with 33 points and 19 rebounds. The Magic pulled away, but, late in the game, Atlanta got it back to a 2-point lead. 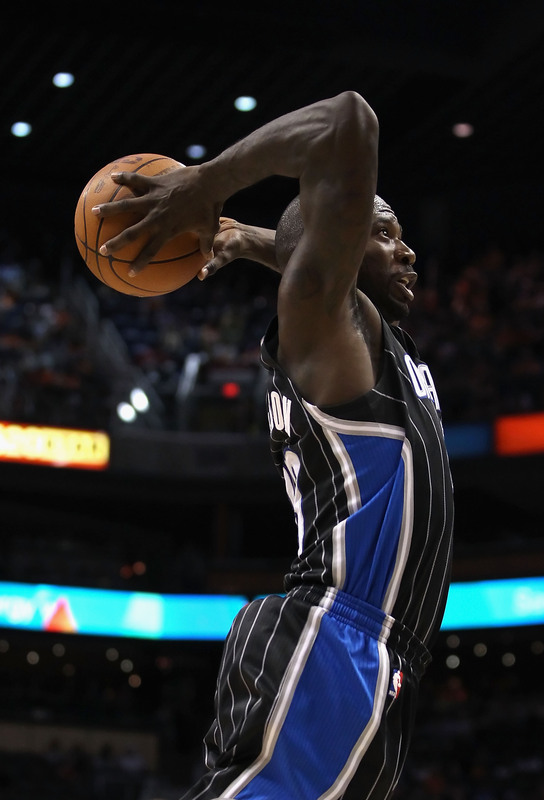 However, late in the game, when it mattered, the Magic’s Jason Richardson hit a clutch 3-pointer to give the Magic a 7-point lead and cruise to a victory. Now the series heads back to Atlanta tied at 1-game a piece. Orlando 88, Atlanta 82. Finally, it was the Portland Trail Blazers and the Dallas Mavericks. This was the popular upset series pick going into the playoffs. The Blazers have been great lately, especially since the addition of Gerald Wallace, and many people thought they would handle the shaky Mavs. But, the Mavs played marvelously in Game 1, and hoped to keep it up last night. The game stayed neck and neck in the first half. LaMarcus Aldridge led the way for Portland with 24 points and 10 boards on the night. 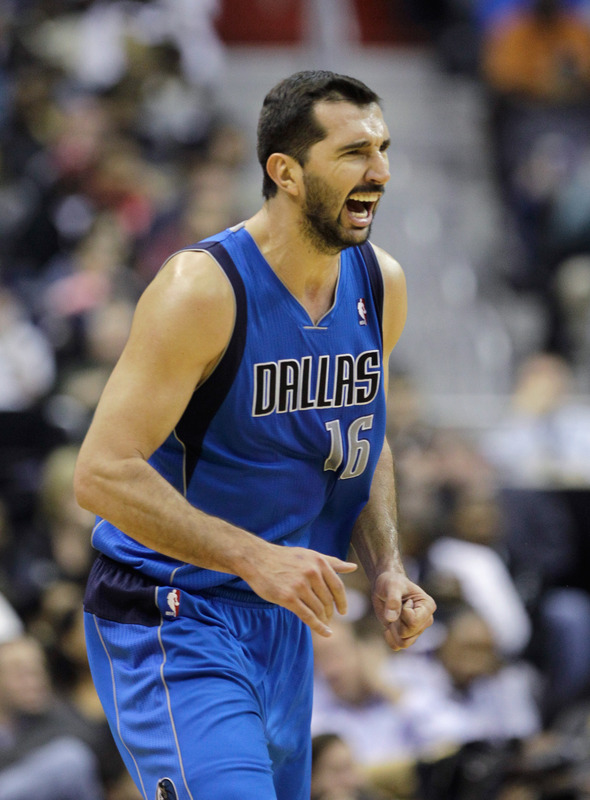 But, in the 4th quarter, the Mavs’ Peja Stojakovic started draining 3s to run away with the game. Now the Mavs take a 2-0 lead in the series, as it heads back to Portland… where their home crowd will be incensed. Dallas 101, Portland 89. 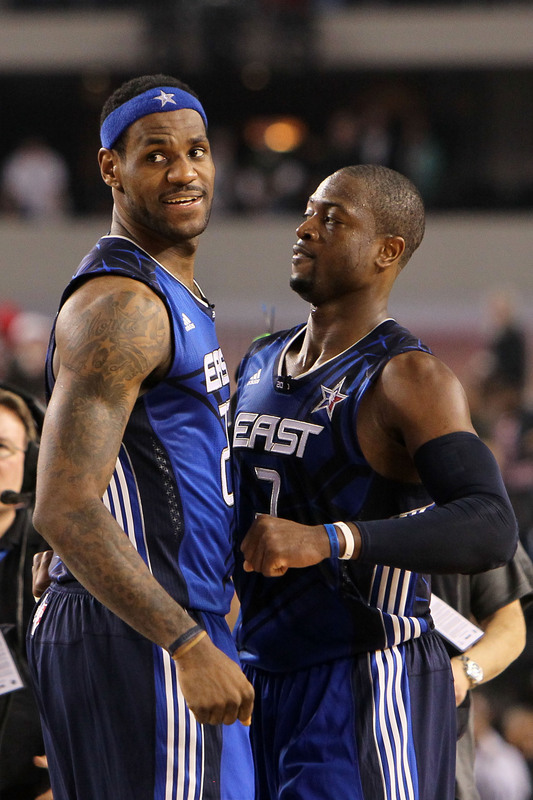 First up, it was LeBron, D-Wade, and Bosh against the 76ers. Despite a loss, the Sixers kept Game 1 close, but could they keep up that pressure? The Heat were ready for the Sixers in Game 2. They were faster, stronger, and more ready to play. Dwayne Wade had migraines, but he still wreaked havoc. The Heat took care of business to take a 2-0 lead in the series. LeBron was the man of the evening, finishing the night with 29 points, 7 rebounds, and 6 assists. Game 3 heads back to Philly. Can they change the momentum? Miami 94, Philly 73. 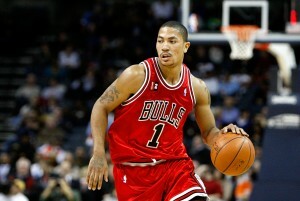 Then, it was Game 2 between Derrick Rose and the #1 seed Chicago Bulls vs. the #8 Indiana Pacers. People couldn’t believe how much of a fight the Pacers put up in Game 1. They even almost won the game if not for a miraculous effort by Rose in the final 2 minutes. But could they keep it up in Game 2? Well, yes. They hung in there with the Bulls point for point, even hitting a long-range 3-pointer to tie the game at 67 going into the 4th quarter. It was even close to the finish, but in the final minutes, Derrick Rose made it happen and sealed the deal for a Game 2 win. He finished with 36 points, and the series now heads to Indiana with the Bulls up 2-0. Chicago 96, Indiana 90. Finally, in the NBA, the Houston Rockets have been a very strange team these past 5 years. Earlier this decade they paired Yao Ming with Tracy McGrady in what was supposed to be a championship team. They even brought Shane Battier in town to help out on defense. That clearly didn’t work out, and they’ve had a couple forgettable playoff appearances the past few years (except when they brought the Lakers to 7 games). They were playing extremely well towards the end of this season, but a few key losses kept them from the playoffs. Now, after 4 years at head coach, they are removing Rick Adelman. Usually when a team gets rid of its head coach, it intends to do a rebuild in direction, clientele and strategy. The Rockets need just that. At the same, time, this is a great time for an up-and-coming team (maybe the Washington Wizards or Sacramento Kings — who had Adelman before) to hire a fantastic coach. This weekend marked the beginning of the NBA Playoffs. And this is the first time in many years that there are no clear favorites. Seriously, we could see a #4 seed vs. a #6 seed in the championship and people wouldn’t be that surprised. Here were the main highlights. The Chicago Bulls surprised everyone this season by nabbing the #1 seed in the East. Prior to the season, everyone argued whether the Celtics or Heat or MAYBE Magic would get the 1-spot. But, Derrick Rose turned into a super human and MVP front-runner and led the Bulls to an amazing season. So, it was pretty wild watching them get crushed by the #8-seed Indiana Pacers. Not until the very end, when Rose led the Bulls on a spectacular run with just under 2 minutes to play, did the Bulls come back and save the home game. Indiana looked very good, but the Bulls brought it up a notch and grabbed the game. Chicago 104, Indiana 99. Then, later on Saturday, everybody thought that the Orlando Magic would have their way with Atlanta. Why? Because last year, the Magic simply crushed the Hawks. They even won one game by more than 30 points. But, what they didn’t take into mind, was that Atlanta is rejuvenated and firing on all cylinders now. And the Magic, well, they’re kind of disjointed. They’ve had a bunch of clientele come and go throughout the season, and aren’t jelling at the right time of the season. Sure, Dwight Howard had 46 points, but Atlanta played the better team ball and stole Game 1 from Orlando. Atlanta 103, Orlando 93. And, on Sunday, the best record in the NBA, the San Antonio Spurs took the court (albeit without their Argentinian star Manu Ginobili). But, the Memphis Grizzlies are a very, VERY tough #8 seed. They’ve been playing fantastic team ball ever since they had a team altercation over a card game mid-season. Veteran Tony Allen was the primary character in that story (wanting money owed for a card game), but he used that to bring the players together. They started talking to each other more, and being honest (e.g. “Hey, you need to pass the ball more”). This type of camaraderie is exactly what you want come playoff time. That’s why they were able to go on a run late in the game, and actually nab the win IN San Antonio. That’s amazing! They even trailed with under a minute to go and still got the win. This team looks very dangerous, and they’re even more scary on their home court. Memphis 101, San Antonio 98. In Los Angeles, the defending champion Lakers were ready to protect their throne. The Lakers have been up-and-down this season, especially recently, going on a losing streak just before the playoffs. But, as everyone knows, the Lakers turn it on come playoff time. 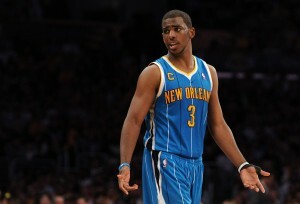 Then again, they kinda forgot that the New Orleans Hornets have one of the best players in the NBA: Chris Paul. Paul played out of his mind on Sunday, putting up 33 points and 14 assists. 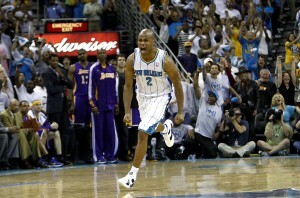 They simply had NO answer for him, and the Hornets just rolled on to a victory. This is the first time since the NBA expanded the playoffs to 16 teams that a #1 and #2 seed have lost their opening home playoff games. This is set to be one of the best NBA post-seasons EVER!!! New Orleans 109, LA Lakers 100.